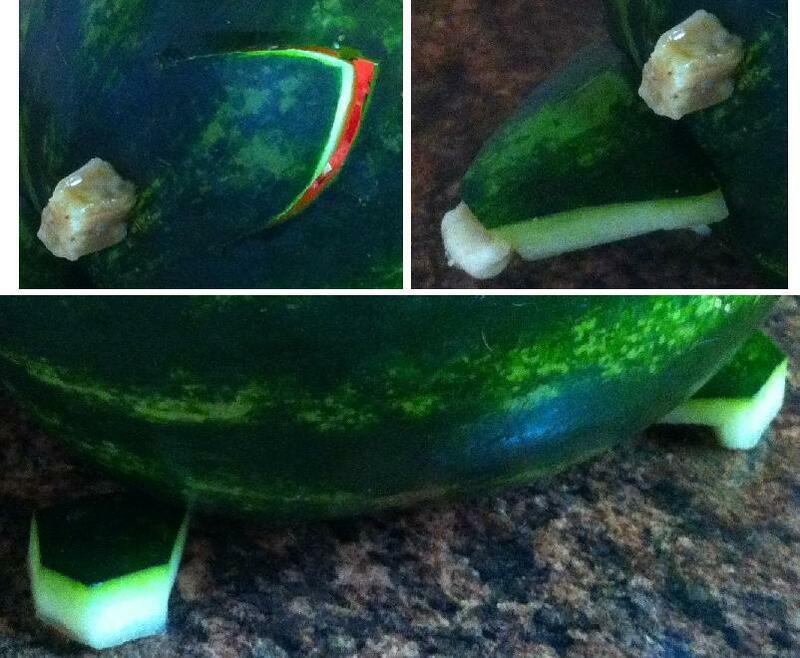 HOW TO CARVE A WATERMELON HEDGEHOG - What About Watermelon? Last month, I chose one of the carvings featured on the National Watermelon Promotion Board’s website and tackled it myself. The result was something resembling a football helmet. Considering the extent of my watermelon carving experience though, it wasn’t a bad effort. It was fun, so I’m going to try to carve a different National Watermelon Promotion Board item each month and post photos of my work here on the blog. I can’t always promise that my artistry will be pretty, but that’s okay, right? Today’s carving actually turned out pretty well. 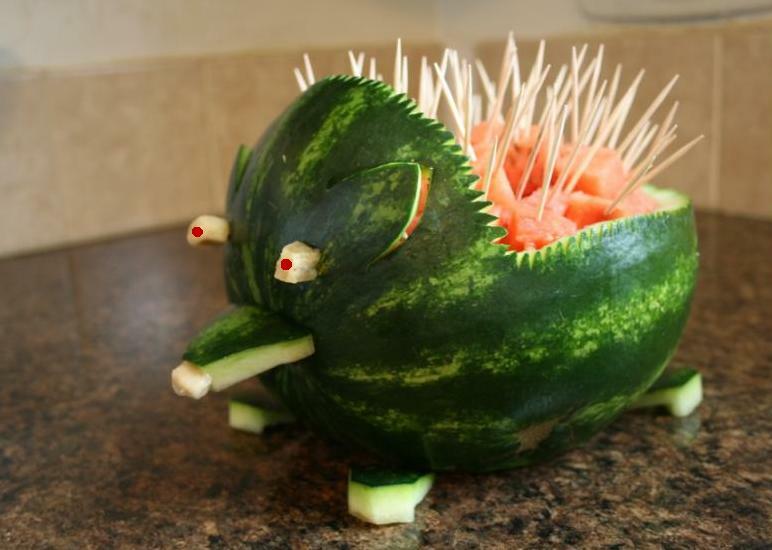 It’s a watermelon hedgehog. I named him Kyle. 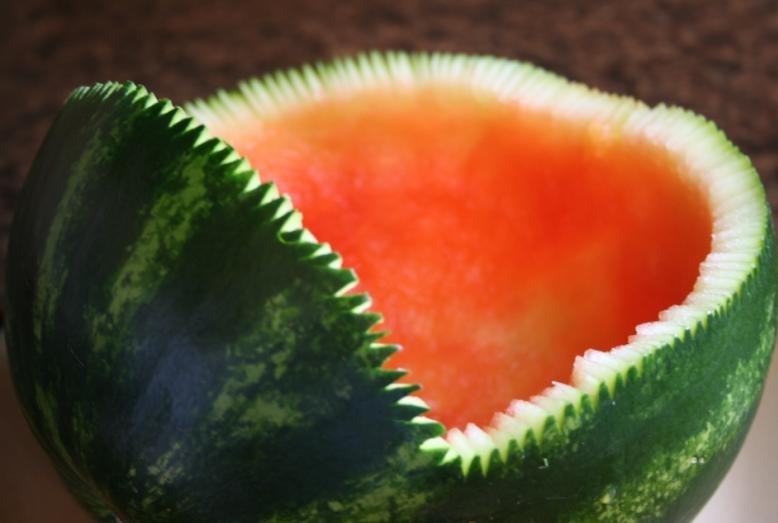 Wash the watermelon under cool running water and pat dry. Turning the watermelon on its side, cut ¼” off the light yellow ground spot on the bottom so that it will provide a flat foundation. Be careful not to cut too deeply into the white part of the rind – this would allow liquid to leak from the bottom of the carving. Place the watermelon so that its stem will be the nose. 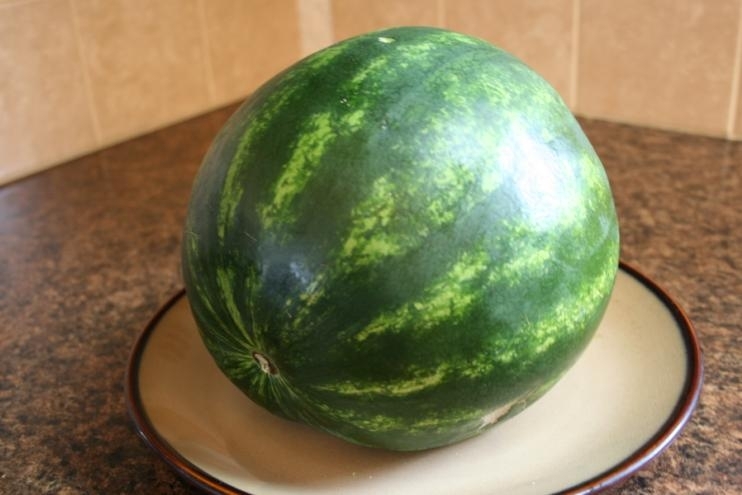 Cut off the top of the watermelon as shown above (draw a cut line with the dry erase marker). Remove this whole portion and place to the side. Using a large spoon, scoop the fruit out of the removed section and from the base. Chop this fruit into small cubes, drain and set aside. Use a small paring knife to make many small cuts to the edges of the head and body, as shown in the photo. These cuts should be short, small, irregular, angled, and curved – almost resembling flames from a fire. These small, irregular cuts create the look of the hedgehog’s coarse coat. Using the removed rind, cut a small triangle to make the nose (upper right of photo above). To attach the nose, place toothpicks just above the stem spot on both sides and slide the base of the nose over the other end of the toothpicks, rind end down. (You may need to secure with an additional toothpick.) Put a toothpick in the tip of the nose and place a blueberry on the end. Using the rest of the removed rind, cut four rectangles of equal size for the feet (bottom of photo above). Trim the backs of the rectangles thinner than the front, and then make two cuts on the front of each piece to create a slightly pointed paw shape. Attach with toothpicks, rind-end down, to the bottom edges of the hedgehog as shown. To make the ears (upper left of photo above), draw two curved triangles that come to a point where desired along the edges of the face area. Carefully cut with the paring knife. Using your finger, gently push on the cut shape from the inside until it’s only slightly protruding, being careful not to crack or break the rind. This part was tricky because I didn’t want to push too hard, because I was afraid the ears would break off. I used a toothpick wedged inside, behind the ear, to keep the ears sticking out slightly. For the eyes, simply place two toothpicks a bit above the nose and put a blueberry on each end. I forgot to buy blueberries, so I used pieces of banana. 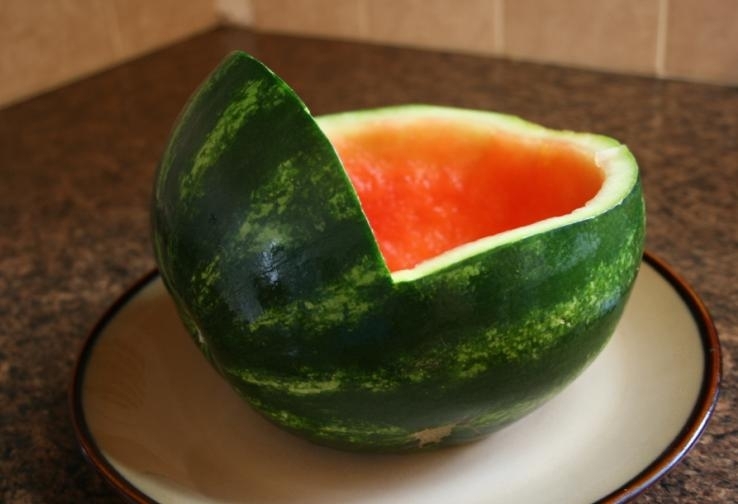 Finally, fill the hollow space in the hedgehog with the watermelon cubes. Place toothpicks in the cubes at the top to create the hedgehog’s coat. You did a marvelous job on the hedgehog. You’ve got more talent than I do that’s for sure. You should give yourself a prize. great job, looks just like a hedgehog!